Do check the recipe here!! Sago Kesari / Javvarisi Kesari!! Sago Kesari is a real treat to people with a sweet tooth. Kesari is a sweet Indian dessert that tastes so good. Am sure everyone must have tried Kesari with rava and semolina, but try with sago it tastes like jelly, is so good to taste and the best thing is, it is so easy to make. There are two methods to make this kesari you can try this with using water or milk, but milk tastes more creamier and rich. Still some don't like the milk flavor such people can try the simple method. This has been my hubby's favorite and I make it specially for him. If interested do check out the recipe here. Meena, is one of my most dear friend, whom I have got through blogging, though we have not met in person we do have shared a lot of things. She is a very, humble and fun to be with kinda person, whenever I have a chit chat with her its really becomes an unforgettable moment. She has a good sense of humor and is a very vibrant person, and every time I have a chat with her I feel refreshed. She has always been supportive and helps me at times of need, she has also been a very active participant in my South Vs North Challenge (SNC event). We do have a separate Google group for the SNC event and she is the most hyper-active chatterbox aka rowdy there!! Am really happy to have such wonderful friends all around me in this blogosphere. Meenu's comments are something always noticeable, since it has a real meaning, they are not just composition of words, but those are statements or comments that really fit into the scene. I really like the encouragement and support she gives to her fellow bloggers. Thanks Meenu for being such a wonderful, lovable human and friend. 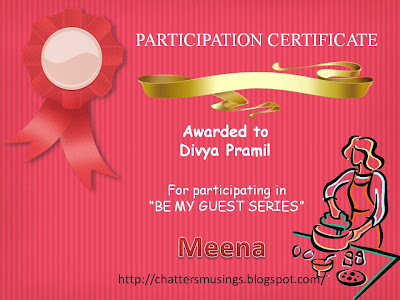 I must mention about Meenu's blog here, its a very delectable space with all homely recipes. Do check her blog and keep supporting her. For participating in her guest post series she has awarded me this certificate!! Thanks Meenu!! in Asiya Omar akka's Feast Of Sacrifice Event. Thank you so much Akka!!! She has really put in a lot of effort in the event and its round-up. 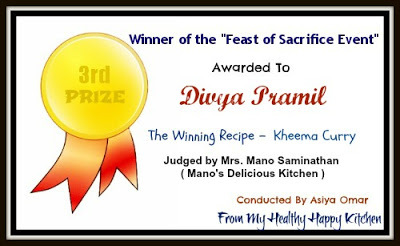 And am so glad that I hav won the prize after being judged by Mrs. Mano a very famous recipe writer!! Do check out her recipes here!! Thanks Asiya Akka you have really made my day!! Check out my winning recipe here!! it was pleasure to have another of ur post on my space. Hugs for you too Meenu for being such a nice friend am happy to do a post for you :)..
congrats divya :) this kesari is in my to do list.. will try it soon..
Congrats divya!! Colourful delicious dish..love sago kesari. Great post and congrats on your win too. Thanks for visiting my site and leaving your message regarding Samosas. Innovative recipe,yummy kesari..will surely try this. Congrats Divya. Nice post.Sago Kesari looks delicious. Congrats divya. Wishing many more awards. Sago Kesari looks delicious. Congratulations on the WIN!! very well deserved.. also a very nice post for Meena, your word perfectly mirror her personality! Delicious sago kesari, loving it.. Btw congrats Divya,we both won together the 3rd prize,am so happy for you. I luv this texture and the visibility of the sago pearls. So so perfect and it looks divine. congrates on your all awards and keep on digging on innovative recipes. this is so new! never seen this kind of recipe before~!